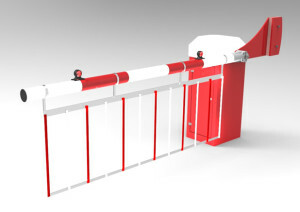 Ultimation Direct have designed and manufactured the next generation automatic barrier. Made for ease of use and simple installation. The D3250 is a popular security solution that has proven to be very reliable product to prevent unauthorized entry on your site. This product is highly efficient with a three phase, Italian made, inverter driven motor and gearbox. Including a user friendly Toshiba inverter interface making working on ultimations automatic barriers even easier. The eye catching fresh design includes two fully lockable side panels that are easily removable making the bolt down stages during installation simple. Designed with the customers in mind, you can make your entry to your property look very professional with the logo cut doors that have an extra optional L.E.D back drop. 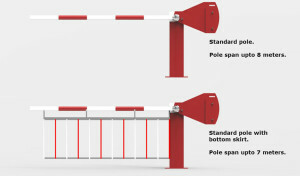 Pole spans of up to 7 meters are available. Many more optional extras are available please call us to find out more. The D3800 HD Barrier from ultimation direct offers one of the most robust and reliable barriers out there. Specifically designed to offer. Popular for locations such as heavy goods vehicle parking sites, airports and car parks. If high efficiency is what you are looking for, the D3800 HD has a high end Italian engineered three phase motor and gearbox that is Toshiba inverter driven giving an excellent almost silent operation. This barrier is available in a wide range of colours to suit the customers on site needs, powder coated finish. 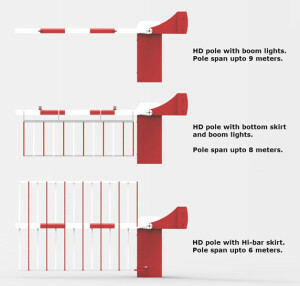 The D3800 HD offers pole span lengths of 9.0m with various pole types available. Ultimation Directs D1500 Manual Barrier is the perfect solution to enhance your site security at a low cost. Designed and manufactured in the UK, the D1500 is simple to open/close and very easy to lock in your preferred up or down position with the pad-lockable slider bolt. Simple to install. Ideal for car parking locations that want to easily prevent unauthorized access to their site. The D1500 is a very sturdy product and made using high end BS EN steel. Choose from a wide range of powder coated finishes and colours to meet your requirements. 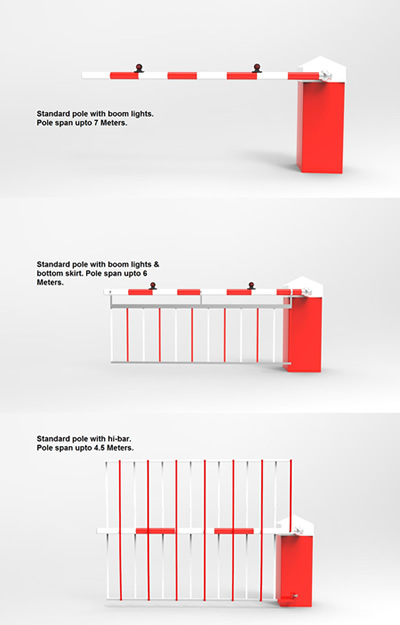 Pole span sizes are up to 8.0 meters, available with a bottom skirt. Ultimation Direct offer a traditional style automatic barrier that is commonly seen in locations such as car parks and industrial sites. Including a high end Italian made motor and gearbox combination that is driven by a Toshiba inverter giving full efficiency and an almost silent operation. Simple to use Toshiba inverter makes setting custom parameters easier than ever. Simple to install. Powder coated finish that is available in a wide range of colours to meet the customers requirements. The D3200 offers pole spans of up to 7.0 with optional extras listed below.